Recovers data from Android phones, cameras and all kinds of memory cards. 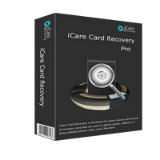 iCare SD Memory Card Recovery Pro 1.0 was available as a giveaway on July 16, 2017! 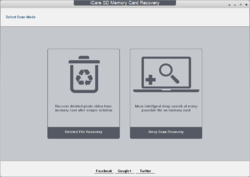 iCare SD Memory Card Recovery allows to recover data from Android phone cards and camera cards: SD(SDHC, SDXC, MicroSD), CF Card, XD card and other memory cards of all kinds of brands. The piece of software may come in handy when you need to recover data from accidentally/intentionally formated cards asking for reformatting or if data becomes inaccessible after formatting, virus attack, file deletion on phones/cameras etc. Supports Mobile/Camera SD Memory Card, MicroSD/tf, xd, CF Card, SDXC, end other devices. 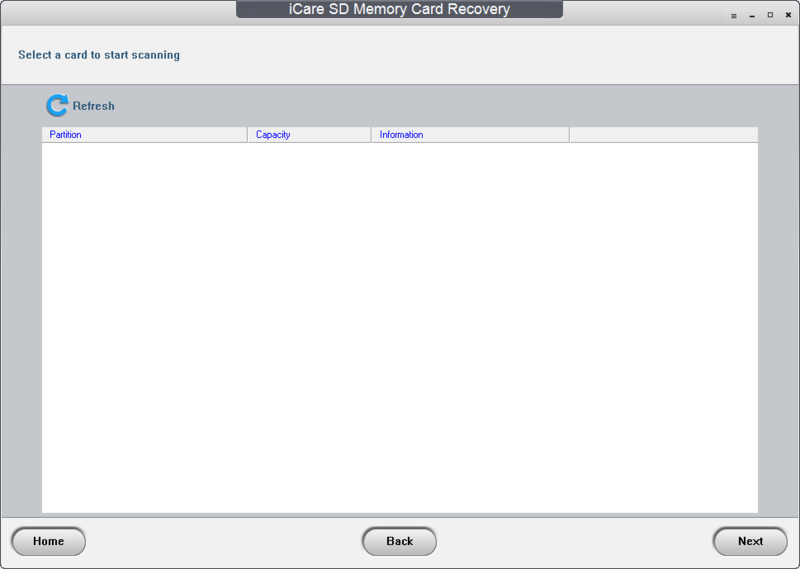 How would you improve iCare SD Memory Card Recovery Pro 1.0? Didnt get to try it as despite several attempts the email never arrived! (0xc0000022). Click OK to close the application. " Worked great recovering pictures I had deleted on my SD card but it would not find the movies. I had about 6 very short .MOV files but it did not recover them. The movie files are the ones I actually wanted to recover. Installed and registered fine on Windows 10 32bit Laptop Computer. iCare could not see my 32G SD Card. 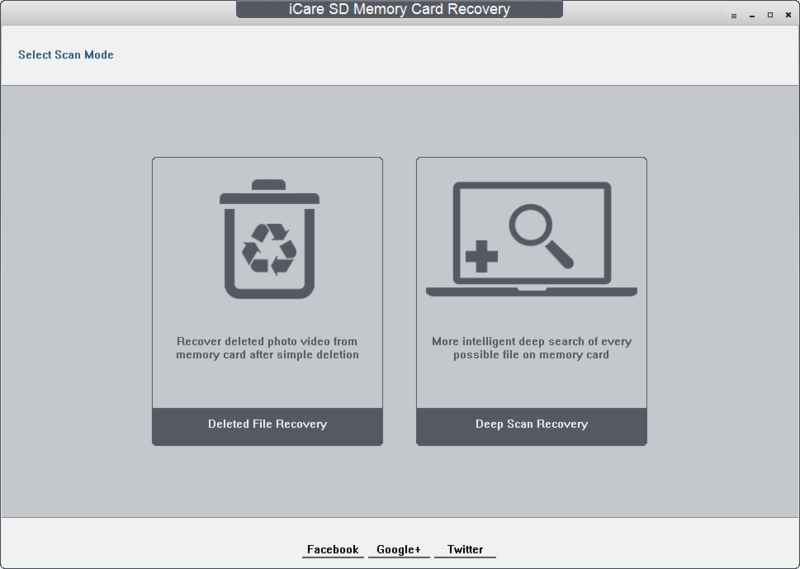 Other recovery softwares see the SD card without any fuss (Kerish Doctor). Explorer shows SD Card but iCare was unable to after several refreshes. Any solution to this from the developers. Installed and registered fine on Windows 10 32bit Laptop Computer. iCare could not see my 32G SD Card. Other recovery softwares see the SD card without any fuss (Kerish Doctor). 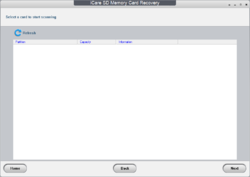 Explorer shows SD Card but iCare was unable to after several refreshes. Any solution to this from the developers. I also have icare Date Recovery pro. Don't know if that makes a difference but I ran that then downloaded todays offering and it works very well indeed. Its a bit 'Clunky' and somewhat fussy but with perseverance it found 258 deleted files from a 1Gb SD card with ease and they were all usable tho you really need to recover them to a partition on your HD before reading them. When i first ran it I then plugged in my SD card holder/adapter to USB and had to hit 'Back' before it recognised the card but that was to be expected really. Worth persevering with as it DOES work, and better than i expected - And I am a Virgo!! I also have icare Date Recovery pro. Don't know if that makes a difference but I ran that then downloaded todays offering and it works very well indeed. Its a bit 'Clunky' and somewhat fussy but with perseverance it found 258 deleted files from a 1Gb SD card with ease and they were all usable tho you really need to recover them to a partition on your HD before reading them. When i first ran it I then plugged in my SD card holder/adapter to USB and had to hit 'Back' before it recognised the card but that was to be expected really. Worth persevering with as it DOES work, and better than i expected - And I am a Virgo!! Doesn't work on my XP laptop, cant read the bottom of the screen or shrink it. Tried to leave feedback on their website doesn't work either. Also doesn't work on hard disks, uninstalling it. Junk. michelangelo, then all your cards are damaged and no recovery-software will be able to recover the deleted files. The alternative might be to try to install on a removable disk/card or memory stick. Activate it and leave it till ready. The closest to bullet proof method Ive found to keep giveaway offers is to install them to a VM [Virtual Machine] running Windows 7 or 8 -- that avoids problems if you reinstall Windows, & avoids the chance that an app will deactivate after upgrading builds or versions of 10, which is done now twice a year. The Virtual Hard Disk [VHD] where the VM resides can be located &/or stored almost anywhere, including on removable drives if you wish. And your VM(s) can often be moved to another device or version of Windows & stay intact -- I've done this by copying the VirtualBox VM files [not the VirtualBox app itself] to the copy of Windows where I wanted to run it. Many giveaway offers will only activate with the key given on the day of the giveaway, & many will also tie activation to the hardware where it's installed. Together with the GOTD setup app, when used, that means the only 100% reliable method of preserving them is to keep disk/partition image backups of that copy of Windows that can be restored to the same hardware if ever needed. That said, IMHO your concern regarding installing every single giveaway offer is valid -- some apps don't work so well, while others have what's to me is an unacceptable impact on your Windows install. I use a separate VM for monitoring & testing that I restore afterward, while some others use a virtualization app like Time Freeze [free] or Shadow Defender [sometimes given away]. Jerry, The closest to bullet proof method Ive found to keep giveaway offers is to install them to a VM [Virtual Machine] running Windows 7 or 8 -- that avoids problems if you reinstall Windows, & avoids the chance that an app will deactivate after upgrading builds or versions of 10, which is done now twice a year. The Virtual Hard Disk [VHD] where the VM resides can be located &/or stored almost anywhere, including on removable drives if you wish. And your VM(s) can often be moved to another device or version of Windows & stay intact -- I've done this by copying the VirtualBox VM files [not the VirtualBox app itself] to the copy of Windows where I wanted to run it. Many giveaway offers will only activate with the key given on the day of the giveaway, & many will also tie activation to the hardware where it's installed. Together with the GOTD setup app, when used, that means the only 100% reliable method of preserving them is to keep disk/partition image backups of that copy of Windows that can be restored to the same hardware if ever needed. That said, IMHO your concern regarding installing every single giveaway offer is valid -- some apps don't work so well, while others have what's to me is an unacceptable impact on your Windows install. I use a separate VM for monitoring & testing that I restore afterward, while some others use a virtualization app like Time Freeze [free] or Shadow Defender [sometimes given away]. TK, my problem is that due to time constraints, I usually end up looking at GAOTD at work during my breaks, and then when I get home I don't always get to load them in at that time because my lappy isn't charged up. I downloaded this one, but I may pass because of the comments I've seen. I store my photos on SD cards and backup to external HD, and Shutterfly, and I've only had one SD card ever corrupt (and that one, I was able to get most of the photos off it). It would be nice to be able to activate them later - which you used to be able to do when this site first opened. DAJ, on rare occasions where the vendor has not demanded strict protection of the setup program, like the cyberlink photodirector 7 deluxe the other day then you can install it when you like if you are running compatible version of windows... 7 or above for the most recent giveaway of that product. I have not experienced electronic failure of any SD card, I have had mechanical failure where the case splits or data corruption caused by getting stung by fake capacity SD cards from China... redistribution of giveaway builds and licenses in the past when the protection was significantly weaker and the mass comunication of how to defeat the weaker protection resulted in GAOTD being forced, by potential contributers demands, to devise less easily defeated access control technology in order to stay in business. The simple solution to your personal dilemma, is plug your laptop with flat battery into the mains charger and download and install the giveaway while it charges. unless you work non-stop 24 hours you should be able to download and install most giveaways within the 24 hour slot! You might even be able to take your laptop charged over night into work and enable wireless access point on your cell phone to get on the internet at work without joining the office network and you can look and install the giveaway during a break at work on your laptop. DAJ, on rare occasions where the vendor has not demanded strict protection of the setup program, like the cyberlink photodirector 7 deluxe the other day then you can install it when you like if you are running compatible version of windows... 7 or above for the most recent giveaway of that product. I have not experienced electronic failure of any SD card, I have had mechanical failure where the case splits or data corruption caused by getting stung by fake capacity SD cards from China... redistribution of giveaway builds and licenses in the past when the protection was significantly weaker and the mass comunication of how to defeat the weaker protection resulted in GAOTD being forced, by potential contributers demands, to devise less easily defeated access control technology in order to stay in business. The simple solution to your personal dilemma, is plug your laptop with flat battery into the mains charger and download and install the giveaway while it charges. 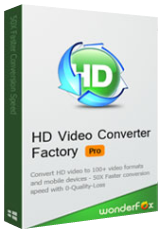 unless you work non-stop 24 hours you should be able to download and install most giveaways within the 24 hour slot! You might even be able to take your laptop charged over night into work and enable wireless access point on your cell phone to get on the internet at work without joining the office network and you can look and install the giveaway during a break at work on your laptop. Jerry, Re "Does anyone knows how to or got an idea on how to preserve these giveaways for later use ?" You are describing my hobby! But as TK has already written, I will not disclose details on this site. Although I think software producers would benefit from my findings. Because some of them produce software that can be used very simply without a proper licence. Jerry, Re "Does anyone knows how to or got an idea on how to preserve these giveaways for later use ?" You are describing my hobby! But as TK has already written, I will not disclose details on this site. Although I think software producers would benefit from my findings. Because some of them produce software that can be used very simply without a proper licence. jim, if you have damaged cards no recovery-software will recover the deleted files! nibo1978, iCare should at least show/find the card even if it's not able to recover files from it. But it doesn't even do that.